IVT’s team of experts manipulates world-class copyeditors, content writers, rephrasing experts with best editing skills. A wide arena that is inclusive of language editing, the creation of Stylesheets, editorial proofreading, indexing and creation of abstract is done by us. IVT provides high-end full typesetting services for the production of books & Journals, offering accuracy and fast TAT. We handle simple to complex data, from straight text to complex math. Our extensive variety of design specifications ranges from single-column to multi-column, from single color to four-color. Our comprehensive knowledge of SGML/XML workflow helps us to take a hands-on approach to handle any complexity of the project. Our extensive skills to work with multiple DTD’s allows us to resolve problems, fix glitches quickly and execute the complex implementation of mark-up languages. 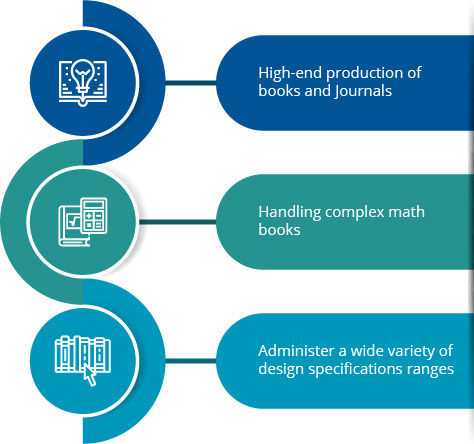 The multiple methodologies at IVT promises enormous book publishing services. We also provide tailor-made packages to suit your specific work and budget. It is a well-known fact that badly edited books demoralize the author and disappoint the reader. Keeping this dogma in mind, we provide editing support at various stages of the written content and a comprehensive critique service to a wide range of editing and proofreading. IVT’s expert teams alleviate clients to reach the challenge of quality conversion and formatting of the contents and its presentation for the customers with unlimited expectation, for every single project.